This article originally appeared on the IDAHO EDUCATION ASSOCIATION website on March 15, 2019. The latest iteration of Public School Funding Formula legislation faces a Senate Education Committee hearing at 2:00 p.m. Monday in the Lincoln Auditorium. SB 1196 is the latest rewrite of legislation aimed at changing how Idaho distributes money to local school districts and charter schools. IEA President Kari Overall will be testifying regarding substantial concerns related to the bill, and IEA members are encouraged to attend if they are able. Monday’s hearing will also be streamed through Idaho in Session. While a revamp of the public school funding formula has been in the works through more than two years of meetings and discussion, the latest version of the proposed bill was just introduced Wednesday. It is extremely complex legislation, with questions and concerns arising at just about every turn. Despite numerous revisions, the legislation (and the formula behind it) still has not been able to address some key concerns raised by the IEA and other education experts. It makes budgeting for local school districts from one year to the next extremely difficult, especially in the absence of modeling that extends to time horizons of three to five years. Many school districts will still be facing the prospect of “falling off a financial cliff” once the three years of hold harmless provisions expire. From a logistics standpoint, the juxtaposition of the successful Career Ladder Salary Allocation plan with the proposed funding formula is problematic. The bill undercuts Idaho’s efforts to increase compensation for veteran teachers, which is a cornerstone of addressing the state’s teacher retention problem. No additional investment in public education is considered through the legislation. Idaho ranks near the bottom in per-pupil funding and too many districts are reliant on local bonds and levies. This is the biggest problem we face from a funding standpoint and carving up the pie differently will not change that. The new formula could serve as a precursor to private school vouchers. For more on this, please read the story below. Rep. John Vander Woude, R-Nampa, has resurrected his private school voucher legislation, introducing HB 253 in the House State Affairs Committee Wednesday. This is virtually the same legislation the IEA and a broad cross-section of stakeholders and public education supporters were able to defeat last year. For a refresher on private school vouchers and the harm, they can do to public education, visit the Protect Idaho Public Schools web page. Even more concerning is the apparent connection between this legislation and the proposed funding formula bill. Vander Woude indicated that he envisioned moving an estimated 6,900 students out of public schools and into private and parochial schools through his legislation and referenced the ease with which it could be done in conjunction with the new funding formula. HB 273 would set up Scholarship Granting Organizations, with the state offering a 50% tax credit in the process. As we noted last year, no state approval or oversight is required to establish these SGOs, which makes this legislation unnecessary—unless the ultimate objective is to divert public funds to private and religious schools. Legislation to set a minimum starting teacher salary of $40,000 has passed both chambers of the legislature. Governor Brad Little proposed this move and will sign it into law during a ceremony Wednesday. HB 153 will go into effect in two stages, with a $38,500 minimum next year and a $40,000 minimum in 2021-2022. Local districts and local education associations will continue to bargain for teacher salaries at or above the new minimum benchmarks. SB 1159, which would make it more difficult for Idaho citizens to gather signatures and place initiatives on the statewide ballot, was held in committee today, but is likely to return for further discussion and potentially a vote. The legislation was brought by Sen. C. Scott Grow, R-Eagle, in the wake of this year’s Proposition 2, aimed at expanding Medicaid in Idaho. Public education supporters will remember that it was a ballot initiative the led to the repeal of the ill-conceived “Luna Laws” in 2012. The bill was held by Senate State Affairs Committee Chair Sen. Patti Ann Lodge, R-Huston following extensive testimony in opposition Friday. That frequently signifies that legislation is dead for the session, but in this case, it is likely to be brought back by the Chair for discussion among the committee members and possibly a vote on whether to send it to the Senate floor. 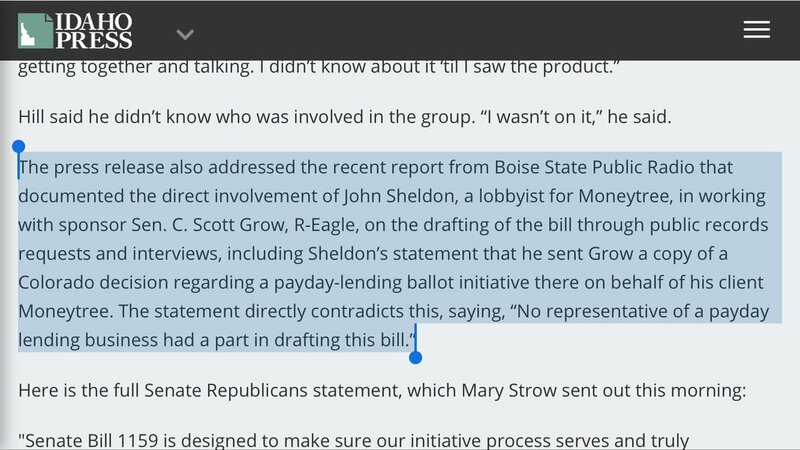 Read more about the legislation to make it more difficult to get citizen-driven initiatives on the ballot in this story from Cynthia Sewell of the Idaho Statesman.